There is currently a discourse within the American Deaf community about the resignation of two Deaf members of the board of the Registry of Interpreters for the Deaf (RID). The members who resigned, Lewis Merkin and Naomi Sheneman, say that the confidentiality agreements they signed when they joined the board prevent them from discussing in detail what happened that they felt they had to resign. They say, vaguely, that they were reprimanded for something they did that was a trifling matter within the norms of Deaf culture, and that, in general, they do not feel the RID board has a Deaf Heart. The resigning members, and others who support embracing the values of Deaf Heart and Native View, demand more Deaf leadership in RID and more transparency from RID. In an attempt to understand the term Deaf Heart, and to catch up on the conversation regarding Deaf members of the RID board, I sought, watched, and collected a playlist of videos about Deaf Heart on YouTube. I also Googled ‘Deaf Heart’ and read and listed two articles below (actually, I had read one of them when it came out last month, and I’m still not sure I understand). I’m sure this is not the complete discourse on Deaf Heart and the Deaf RID board member resignations; this is just all I was able to find. If you know of any other vlogs or blog posts I should add, please let me know. In the meanwhile, I hope these references help others who want to get the news and listen to the discourse. Each of these videos touches upon the concepts of Deaf Heart and/or Native View, though none of them defines it. The first video in this playlists seeks clarification from the diverse membership of the Deaf community (including Deaf people, interpreters both hearing and deaf, people with Deaf family members, social service providers, and others) about Deaf Heart. Deanna Donaldson, the author of this first vlog, requests answers to four questions about Deaf Heart, and invites vloggers to make additional comments for up to two minutes. Her invitation goes out to Houston, Texas, but as it is on the World Wide Web it is a good prompt for vloggers everywhere, and I encourage people to post video responses. I would like to see what people have to say about this thing called Deaf Heart. An observation that might make for another whole blog post is the vagueness in which these vloggers couch their discussion of these confidential issues. Anyone who thinks ASL is not a vague language, or there is no vagueness in ASL, will see that people can in fact use ASL to be vague. I invite those who know ASL — which, by the way, you have to do to be able to watch these videos (sorry) — to note the vague language and tell me what you see. Since so many people responded on my blog to the first video about this topic, “Re Oralism vs Speaking” that I embedded in a blog post, I have been responding and thinking about this issue. One thing that stands out for me is the meaning of the suffices -ism and -ist. These can simply mean “system” or “practitioner” but they also have loaded connotations of strong belief systems and prejudices– and the people who espouse such attitudes and prejudices. This was the first time I had photographed a presenter giving a workshop in sign language. 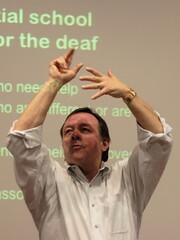 Those who know American Sign Language (ASL) can guess what Dr. Dennis Cokely was talking about. Those who don’t know ASL– well, they can have even more fun guessing. I don’t want to give away the content of his workshop to those who know ASL; rather, I encourage them to take his workshop themselves! As for those who don’t know ASL, there would be so much lost in translation if I simply said, “Dr. Cokely is signing X,” that I would be guilty of oversimplifying his message. And his workshop “Interpreting Culturally Rich Realities” is all about not oversimplifying any interpretation! I thank Dr. Cokely for his permission to photograph him as he worked. While I don’t want to give too much of his workshop away, I do want to use these photos to help myself and others who took his workshop recall some of this repeated points. One of the things Dr. Cokely repeatedly discussed was having multiple lexical items in one’s “mental files” to choose from when confronted with signs or words that represented “culturally rich realities,” or words that are not easily conveyed from one culture/language to another in a 1:1 ratio. As a photographer of a speaker presenting in ASL, I used the textual analysis and predictive skills I’ve developed as an interpreter to study Dr. Cokely’s rhetorical devices so that I would be prepared with my camera to capture him at the very moment when he would repeat one of his themes. As an instructor, he was very deft at using repetition to drive home a point. You may view my set of photos of Dennis Cokely on Flickr. The “attitude” of an interpreter toward ASL and Deaf Culture is highly valued by the deaf consumers we serve. Hence, an ASL ITP should teach the attitudes and cultural values that are desired by deaf consumers. Some say that one way to weed out “unsuitable types” from ITP’s and from the interpreting field is to pre-screen candidates to ITP’s to check for personality suitability. I disagree with this. I believe it is prejudiced and discriminating to disallow students to enter an ITP based on some personality inventory delivered and interpreted by people who are not licensed psychologists. For that matter, even if one brought in licensed psychologists to “pre-screen” candidates, I would be offended.